The European Offshore Wind Deployment Centre, located in Aberdeen Bay, was inaugurated on September 7, 2018, in the presence of Vattenfall`s CEO Magnus Hall and Nicola Sturgeon, First Minister of Scotland. 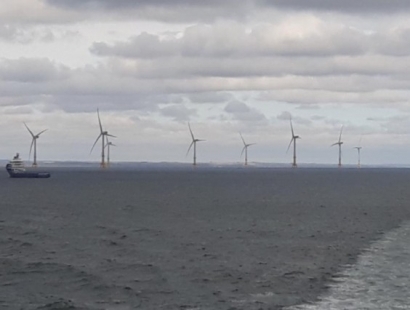 Speaking at the inauguration of the EOWDC, Sturgeon said, “I am proud that as part of this ground-breaking project, the world’s most powerful offshore wind turbines are now up and running in Scotland. The facility is expected to produce enough electricity to meet the power demands of approximately 80,000 British households (312 GWh) every year. Future wind power technology will be tested at the EOWDC, which is one of the first testing facilities of its kind. The aim is to accelerate the wind power industry’s drive for competitive renewable electricity generation. The eleven wind turbines, two 8.8 MW and nine 8.4 MW, have the largest turbine capacity in commercial operation in the world. One single rotor lap from the record 8.8 MW turbine provides a British household with electricity for a full day. Jean Morrison, chair of AREG which was behind the original concept for the wind farm, said, “As Scotland’s largest test and demonstration facility, the EOWDC is a landmark project and confirms northeast Scotland’s pole position in international offshore wind innovation. More than 100 business leaders and dignitaries joined the First Minister and senior Vattenfall staff on a NorthLink Ferries’ vessel for the opening ceremony. With a tip height of 191m and a rotor circumference (164m) larger than that of the London Eye’s, the turbines started generating clean energy from all 11-turbines in late July. With offshore construction starting in February, the main offshore works were substantially completed in just six months.